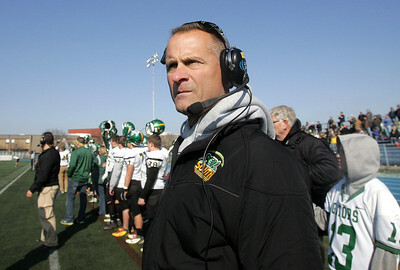 H. Rick Bamman - hbamman@shawmedia.com Crystal Lake South's Chuck Ahsmann watches the opening kickoff. H. Rick Bamman - hbamman@shawmedia.com Crystal Lake South's Dennis Gardeck (5) puts a hit on Lake Zurich's Sean Lynch in the first quarter of the Class 7A first round playoff game Saturday, October 27, 2012. Lynce was able to stay on his feet to get back to the line of scrimmage. 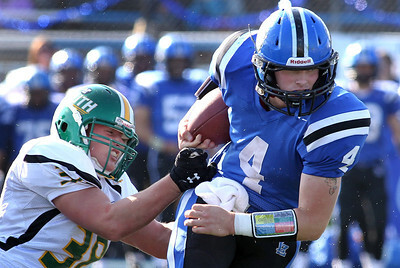 Lake Zurich beat Crystal Lake South 49-0. H. Rick Bamman -hbamman@shawmedia.com Crystal Lake South's John Fitzpatrick (38) slows down Lake Zurich's Noah Allgood (4) in the first quarter during the Class 7A first round play off game in Lake Zurich. 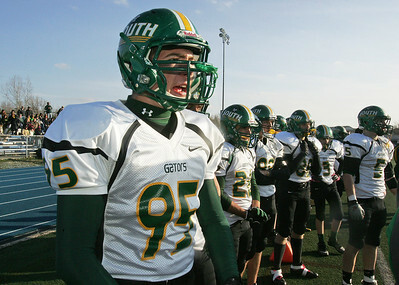 Crystal Lake South was shut out 49-0 Saturday, October 27, 2012. 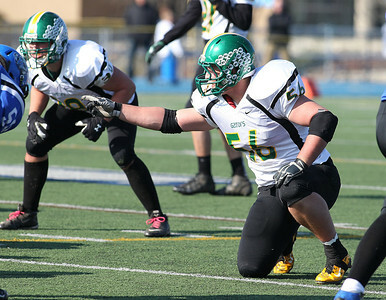 H. Rick Bamman - hbamman@shawmedia.com Crystal Lake's NIck Amren directs a defensive play against Lake Zurich. 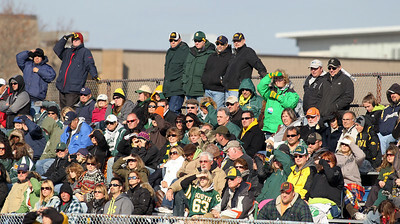 H. Rick Bamman - hbamman@shawmedia.com Crystal Lake fans watch the Gators battle the Lake Zurich Bears. H. Rick Bamman - hbamman@shawmedia.com Crystal Lake South's Corbin Pennino (22), Brandon LaPak (21) and Brendan Chrystal (7) chase down Lake Zurich's Noah Allgood (4) in the second quarter of the Class 7A first round playoff game Saturday, October 27, 2012. Lake Zurich won 49-0. H. Rick Bamman - hbamman@shawmedia.com Crystal Lake South's Brendan Chrystal (left) brings down Lake Zurich's Jake Stauner (10) late in the fourth quarter. 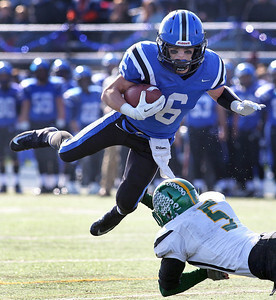 Lake Zurich crushed Crystal Lake South 49-0. H. Rick Bamman - hbamman@shawmedia.com Crystal Lake South's Austin Rogers throws an incomplete pass to avoid the sack by Lake Zurich's Jerry Bauer in the second quarter in the Class 7A first round playoff game Saturday, October 27, 2012. Lake Zurich won 49-0. 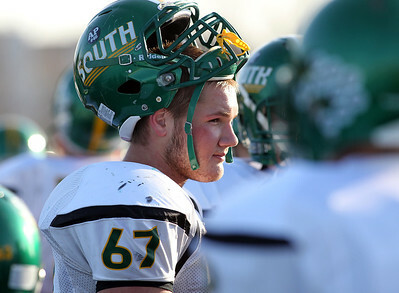 H. Rick Bamman - hbamman@shawmedia.com Crystal Lake South's Kyle Hedge watches the action in the closing minutes of the game. H. Rick Bamman - hbamman@shawmedia.com Crystal Lake South's Brad Christin grinds out a few yards late in the fouth quarter against Lake Zurich. 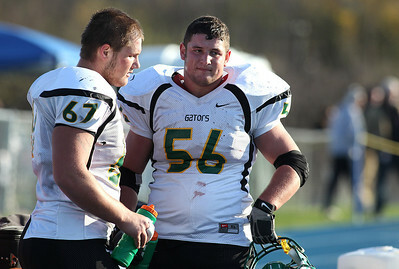 H. Rick Bamman - hbamman@shawmedia.com Crystal Lake South's Kyle Hedge (left) and Nick Amren hydrate on the sidelines in th efourth quarter. H. Rick Bamman - hbamman@shawmedia.com Crystal Lake South's Ray Larke shouts encouragement form the sideline in the closing minutes of the Class 7A first round playoff geame against Lake Zurich. South was shut out 49-0. 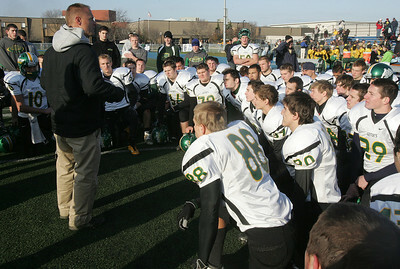 H. Rick Bamman - hbamman@shawmedia.com Crystal Lake South's Chuck Ahsmann gathers his team after the loss against Lake Zurich.